Doncaster Knights boss Clive Griffiths is keeping his feet firmly on the ground despite the success of the high-flying Championship club. Third-placed Knights, who cemented their place in the top four with a stunning 39-27 win away at leaders Bristol on Friday night, are now just three points off top spot following Yorkshire Carnegie’s defeat at Bedford on Saturday. But despite taking great pride in the club’s achievements to date, Griffiths is too experienced a coach to start shouting the odds and making predictions as to what the Knights might achieve in the coming months. 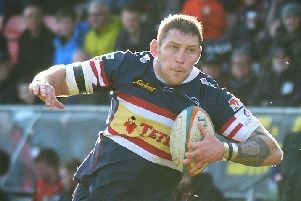 “We’ve got three league games against Moseley, Bedford and Nottingham between now and the end of the year and none of them will be easy,” the Welshman told the Star. “We’ve made a great start and have beaten two of last season’s top four, but we’ll have a better idea of our prospects at the end of the year by which time we’ll have started the second half of the league campaign. “What I will say is that I would be very disappointed if we didn’t maintain the standards, both on and off the field, we have set ourselves so far this season. He added: “The target at the start of the season was to get into double figures when it came to winning games.